Spain will become one of the richest countries in the world! Although the homeland of the matadors de toros has suffered an economic downturn in the recent years, its future seems quite optimistic. Financial experts estimate a GDP, a measurement that shows country’s economic influence and power around the world, of $1,340.27 billion by the end of this year. That will make Spain the 14th wealthiest country in the world. Nevertheless, only 50 years ago Spain was a fascist totalitarian country. Yes, the way that Germany was under Hitler. However, it could survive under Francisco Franco’s regime, which was harsh af. Sexual inequalities, political monopoly, economic downturn. Reforms that step by step brought Spain to democracy transformed the country. So, How did Franco’s Spain become a democracy? Franco died. In Barcelona people were happy. Reform had been in the air for several years and now the central obstacle – Franco – had been removed. Historic time for Spain – both government and opposition agreed to reforms. Spain – trying to “reconcile the irreconcilable.” In the background there was always possibility of pronunciamento – declaration by which a military coup d’etat (i.e. a military dictatorship) is made official. Memories of the civil war. First key decision by King Juan Carlos – reappoint Franco’s PM -Arias Navarro (the Butcher of Malaga). Francoists still filled the key institutions, including the Council of the Realm, which nominated the terna- three candidates for PM. 1976 – Arias introduced few democratic reforms. Opposition wanted more – clashes between them and police. Demonstrators dealt with in Francoist fashioned suppression – 5 killed. Arias was struggling to make the Cortes – full of Francoist members – to pass a bill that allowed political parties. He could not achieve that and resigned. Reformists hoped for someone liberal. They saw Suarez as a young general of Franco’s Moviemento National. The reactionaries in the bunker – a group of hard-line Francoists – were delighted. 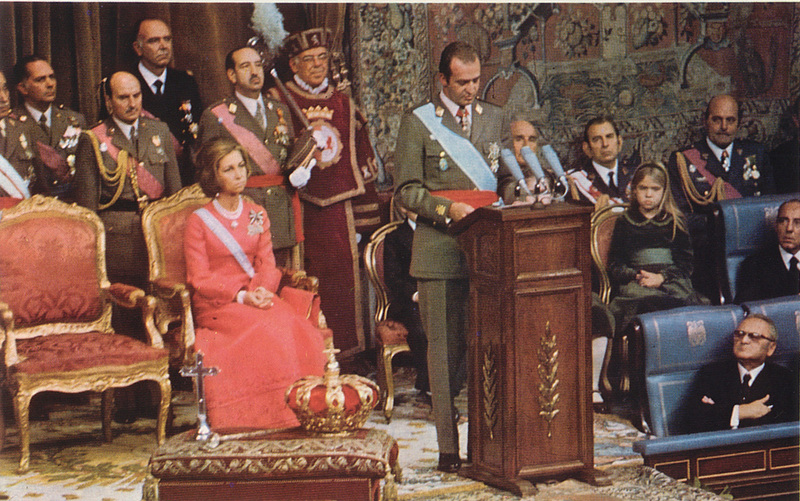 Suarez was one of the politicians, invited by the king before Franco’s death to outline Spain’s future. Suarez had a real detailed plan. Juan Carlos saw a young man with persona in him, who also had a detailed understanding of the Spanish politics. In a few months of his appointment, Suarez presented a thorough reform bill to Cortes, which would transform the political landscape and take the bunker off guard. 18 November 1976: Law for Political Reform passed. Suarez was also the head of the Spanish state television – the whole reform process was covered by media and everything was explained to people in details in the debate on the November 18th. Miranda prevented the dilution of the key elements in the Cortes by the amendments. Franco’s deputies were called by name to vote for or against – broadcasted on TV. The law passed the Cortes 424 for and 59 against. Dec 15 – referendum. 94% voted yes. Socialist Party (PSOE) held its first congress in forty years under Felipe Gonzalez. As a result of contacts between Gonzalez and Suarez, the democratic monarchy was accepted. In February, PSOE was recognized. Legalizing the communist party – PCE – was more problematic due to the risk of the right-wing revolt. 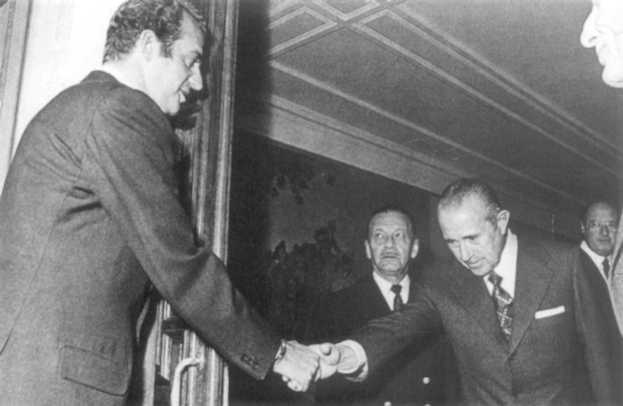 Due to Atocha Massacre (radical right-wing activists killed murdered 5 trade unionists) and Santiago Carrillo’s willingness to negotiate, persuaded Suarez to legalize PCE. Trade unions were legalized in late spring, right to strike recognized and Franco’s Moviemento  abolished. No majority, however, Suarez decided not to form a coalition, but inclusive set of agreements (Moncloa Pacts – 25 October) involving all the major political parties and trade unions. As a consequence, Dec 6, 1978 – the Spanish Constitution approved by a referendum – represented broad spectrum of the political parties in Spain. It is one of the most democratic in Europe and defines Spain as a parliamentary Monarchy, rather than a constitutional monarchy. Abolished death penalty and links between the state and the church. Moreover, it gave a significant power to the regions and the “historical nationalities” (Nacionalidades historicas). Those who participated in the coup considered the Spanish political and economic conditions as collapse. Basque ETE terrorists group was getting aggressive in demands for independence. Moreover – division within UCD over the extent to which Spain required social reform. Abortion, homosexuality – legalized, adultery- abolished. These topics divided UCD. Thus, it appeared to fail to govern effectively. Jan 1981- Suarez resigned and in months before Calvo Solitero could take over, a faction within the army attempted to seize power by force. Colonel Antonio Tejero – occupation of the Congress of Deputies – held Political elite in hostage for 24 hours. He claimed that he follows Juan Carlos’ orders, but the king quickly acted to reject his involvement and ordered the army to follow his orders. No one knows who was behind the coup, but it helped the socialists to win the next elections. PSOE was deviating from its Marxist origins. The above mentioned reasons, moderate program of reform plan and Gonzalez’s effective media campaign brought to a victory (49.4%) with 201 seats in Cortes-comfortable majority. This victory marked for many historians as the end of La Transicion, as it demonstrates that there could be a change of power in Spain without the involvement of the army or unrest. La Transicion became an inspiration for movements in Africa, Latin America and Eastern Europe, however, it is undeniable that there was violence that accompanied it. After Franco’s Death, in 5 years more than 100 demonstrators were killed by the police or Francoist groups. Also, there was a lack of justice in this situation for the victims of Francoism. Gonzalez: “There was not sufficient strength to demand either justice or, even any explanation for the past.” In South Africa, for example, there have been “truth and reconciliation” commissions, designed to heal the wounds of dictatorship. In Spain La Transicion  was accompanied by what Spanish call Pacto del Olvido – the unwritten agreement by all sides to forget what happened under Franco. Only very recently has this been called into question.